Well it’s been raining, there’s been rain and of course there’s been more rain. There pretty much hasn’t been a day since before Christmas that there hasn’t been rain. 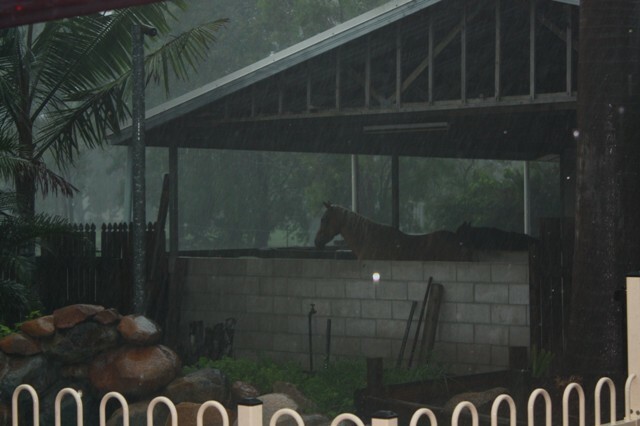 This photo is of the horses in the stables taken in the middle of the day last week. We haven’t had flooding like the poor people in other parts of Queensland like Rockhampton, Toowoomba, Lockyer Valley and Brisbane and also those now being affected in parts of NSW and Victoria. To those who have lost family members, pets and especially horses, my thoughts are with you.